I’m not really the restaurant reviewer, my reviews tend to be either, “I liked it, it was good” or “I didn’t like it, it was bad.” I’m not a big foodie, I like what I like and don’t like what I don’t like. I liked Tini. Went to Tini last night for drinks and dinner and drinks and dessert and drinks. Tini is a bit esoteric for Providence, but I think we can handle it, it feels like it was transported straight out of Tribeca, and that’s a good thing. 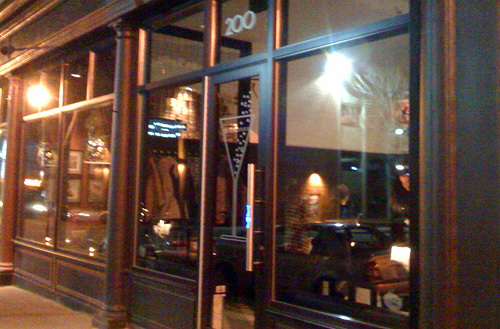 It is at 200 Washington Street (between Gracie’s and Bravo), most recently it was a wiener place. The restaurant is it’s name, tini. There are perhaps 25 bar stool seats arranged in a U-shape and that’s it. The bartenders/waiters/servers (I’m not sure what you would call them, but they are very cute) stand in the middle of the U dispensing drinks, telling you about the menu, and bringing you your food. The menu changes frequently, at the very least weekly, with a few stand-by’s staying on week to week, such as the tini weenie (an homage to the space’s former tenant). We arrived at 5:30pm and the place was pretty well packed with pre-show crowds on their way to Trinity Rep. I started with a cosmo (it just felt right to have a cosmo in such a New York feeling space), for my dinner I had a grilled oyster and chorizo jambalaya (a special in honor of Mardi Gras). It was delicious and served with Mardi Gras beads, yay! Dessert was a flour-less chocolate cake and I had another cosmo and a raspberry lime ricky in there somewhere. The food was delicious (like I said, I’m no foodie, my review ends at “I liked it”), the space is warm and cordial (did I mention how cute the servers are? ), and the prices were reasonable. Reservations are accepted early, but later in the night it is pile in and find a seat where you can. Sitting elbow to elbow you get to chat with other parties, something that is a little off-putting for a lot of us button down New Englanders, but nice once the ice is broken. We also had a fun James “ooh piece of candy” Woods spotting. the washroom was pretty swank, too.